Start by slicing up the nectarines into small chunks, then place into a non-stick pan along with the raspberries, agave nectar and water. Simmer on a low heat for about 5-10 minutes. For the topping; mix together the oats, sunflower seeds and maple syrup in a bowl. I chopped up the pumpkin seeds roughly so that they were slightly less chunky (use a large sharp knife). Place them into the mixture and stir in. 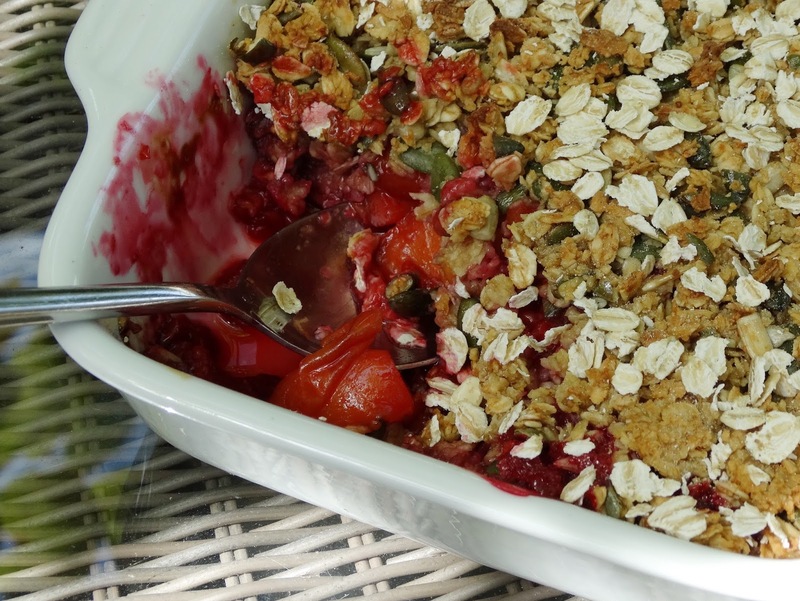 Finally, place the stewed fruit into a ceramic oven-proof dish and top with the oat and seed mix. Bake for around 10-15 minutes, until lightly golden brown on top. Serve up on its own or with a splash of soya cream, a dollop of dairy free yoghurt or a scoop of dairy free ice-cream. I hope you enjoy this one, I certainly did.